Siamese Laksa has an opposite flavour from Penang Laksa. When you combine both, it taste out of this world. 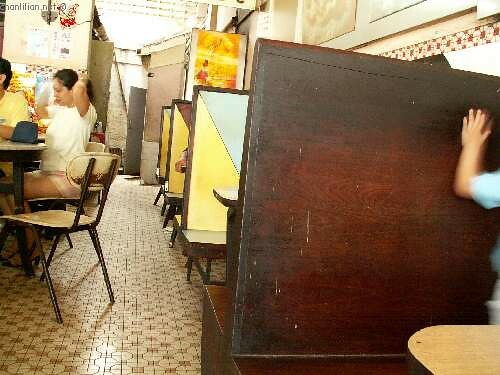 If you have it in an old, old kopitiam with marble tables and traditional coffee with saucers and cups that have chipped, it seals some memories. What more if they have these sectional tables and chairs? Does anyone remember when they were small and sat at these sort of chairs? You would need to stand up and peek over the high back chair to see the person behind you? Back to Siam Laksa, it is actually a little like curry mee soup based. Made from coconut milk and lots of kaffir lime leaves and lemon grass. Frankly speaking, if you are used to the sourish Laksa, you will need a little adjustment to the taste buds to savour the milky type. Therefore, what I ordered is usually a mix. Both type of sour and milky soup mixed into one bowl. This bowl of Siam Laksa is from Pulau Tikus. The shop is exactly opposite the Pulau Tikus police station. Available only after 1pm. The kopitiam’s name is Swee Kong or something. If you walk a few doors further, you can find a smoking char koay teow stall which also sells Siam Laksa as well. You can’t miss the char koay teow stall because they fry the koay teow along the five-foot way. Creates traffic jam because every car stopped by to ta-pau (take-away). Oh, soooooo delicious! You might also be interested to know that after more than thirty years without half boiled eggs, your delectable photos inspired me to give them a go. I have suddenly developed a great liking for half boiled eggs for breakfast! Been eating half boiled eggs and sugared toast the past 2 mornings! Hahaha, and to think that I used to hate it as a child! Argh!! !You are making me wished I am back in Penang again!!! Lrong – Hang on, soon you will be eating Laksa Kedah, with a slice of egg, some limau kasturi, brownish soup with cili padi, bunga kantan….. I don’t know why it is so hard to find Laksa Kedah in Penang. I really love those. Simple taste. facets – Yeah, I know which one you are referring to. The one under the shady trees with nice ice-kacang. Problem with the place is to find a parking and the food there are expensive lah. Especially the char koay teow. Tinkerbell – Hahaha, don’t over eat and put on weight and blame me. But the combination is really nice ya? Especially with a cup of traditional coffee. 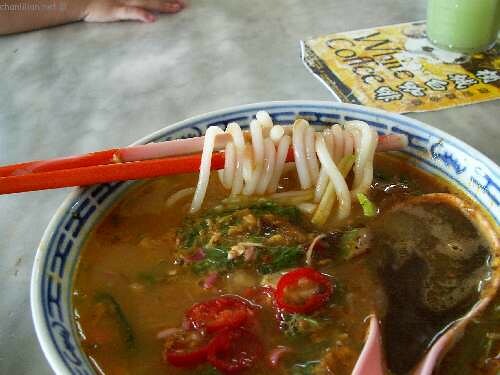 lilian, I now want to book an Airasia ticket to Penang just to makan that yummylicious laksa!